Following a week of research, I've finally come up with a training route in the USA that should prove to be a really tough test indeed. In early September, I'll be starting out near Stovepipe Wells Village, situated in the north west point of the image below. 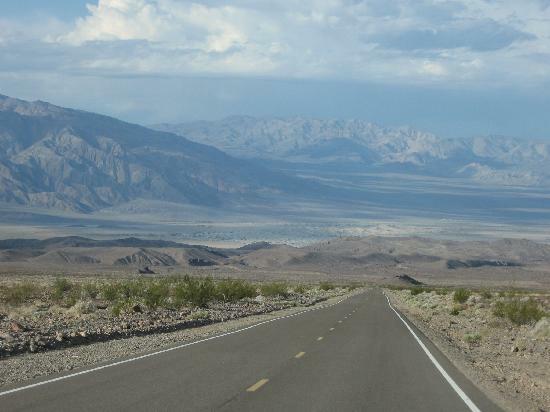 The route will then descend below sea level and into Death Valley. The lowest point of the route is Badwater Basin at 282 ft below sea level. The end of the route is some 73 miles later in the south east at Jubilee Pass where I will reach a point above sea level. This will be the third and final major test of my Summer 2012 training schedule. As you can probably tell from the images below this is going to be a stern test. If I get through this particular run with some degree of success then it should give me a tremendous boost going into the final 12 months of training for Australia 2013. 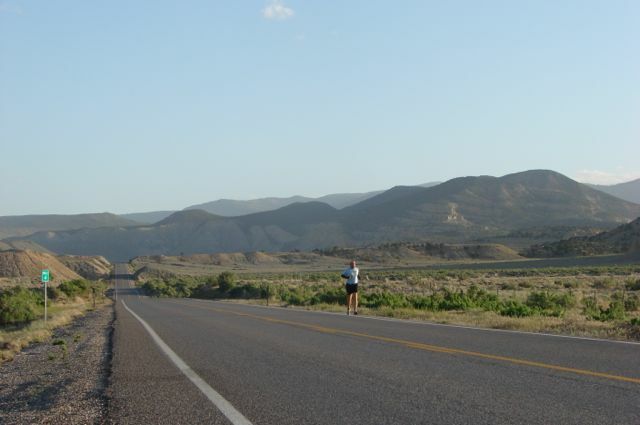 I daydream on a daily basis about last year's run across the USA. The chance to return there and attempt a run of this difficulty is a tremendous opportunity. Death Valley is set firmly in my sights, just as the Mojave Desert and The Rocky Mountains were once over. As ever, there is so much hard work to be done between now and September. Thanks to an article on nufc.com there had been an increase in donations for St Benedict's Hospice and The Children's Foundation overnight. It was always nice to start a day with some good fundraising news. As far as I remember, the fund was approaching the £34,000 mark around this time. There was still a long way to go to hit the £50,000 target that I'd previously set. 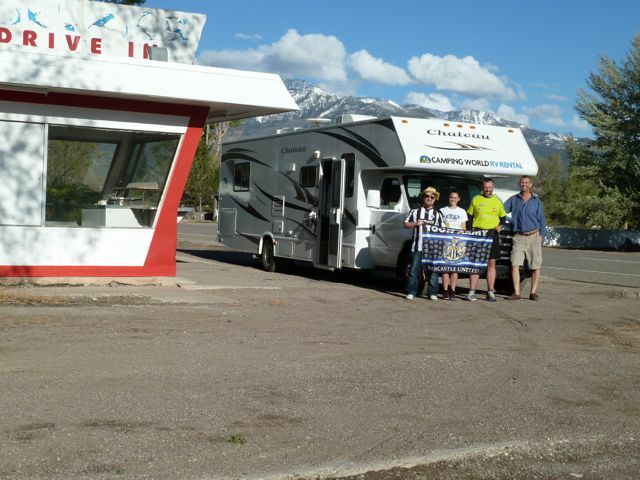 While the support team were doing various RV related duties in Emery, I was dropped off 5 miles to the south in the hire car that Shelli used to join the team and Comedy Jon would use to leave it. The plan was to run without breakfast and get something when I got back to Emery. It was a lovely sunny start to day 27 and I set off running at 07:57 (Mountain Time). I could see for miles in either direction and the picture below was my view looking back from the day 27 start line at the previous day's closing miles. 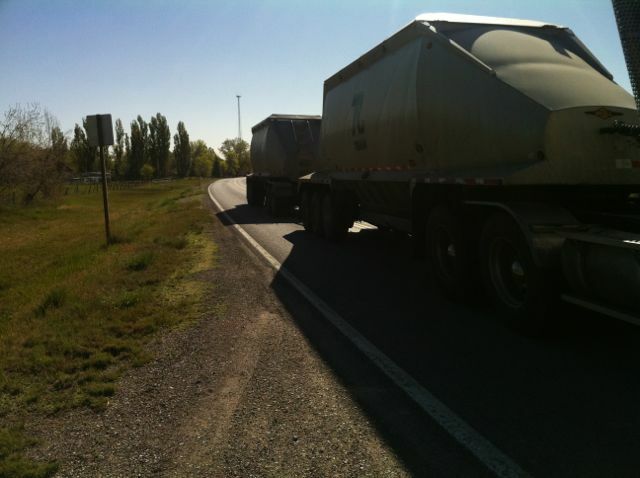 I wasn't alone on the road as truck after truck made their way in either direction alongside me. Maximum concentration was once again needed. 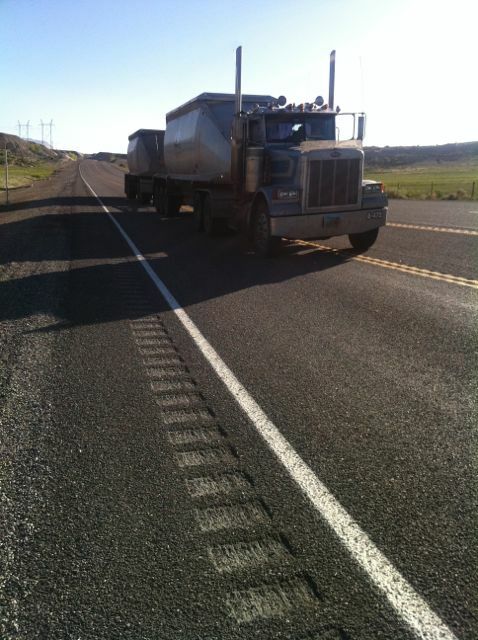 More often than not, the trucks would pull out to give me a bit of room (like the one in the picture below). That was usually accompanied by a wave from the driver and always helped to put a spring in my step. When the need arose, I was always prepared to run well away from the passing trucks. You can see the almost none existent hard shoulder in the picture below. Thankfully, having so little room to run was a very rare occurrence in the USA. 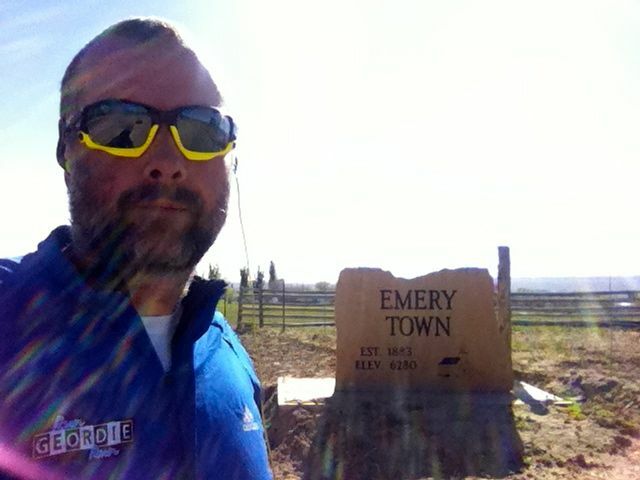 I reached Emery after 5 pretty slow miles. The usual helping of Porridge was on the menu for breakfast. My blog from that time reads "I've just ran through the town of Emery which, according to Wikipedia, 'sits at the base of the mountains that contain the North Horn Formation. 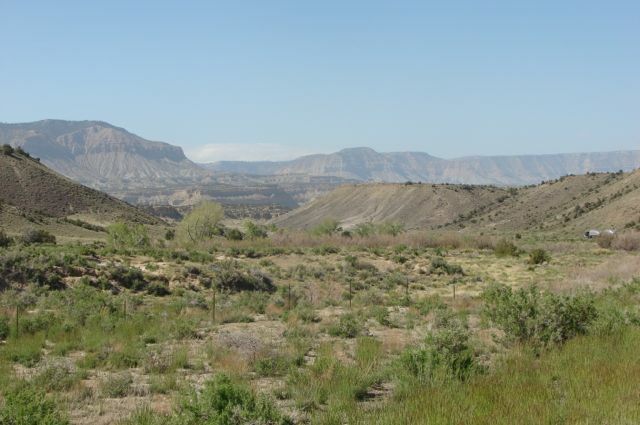 Named after North Horn Mountain, near Castle Dale, Utah this formation in Emery County contain numerous Cretaceous-Tertiary Era fossil invertebrates, microfossils and palynomorphs. Flagstaff Peak, north of Emery, has abundant dinosaur bone material and pre-historic mammal remains and petrified dinosaur footprints.'. As soon as I see a Dinosaur you'll be the first to know!". While I was eating breakfast I received a video message from adventure, cyclist and documentary maker Mark Beaumont. It's well documented on this blog how much I've been inspired by Mark's adventures. He is a modern day hero and someone I really look up to. I played the video over and over. Kirsty said "When the video message came in from Mark Beaumont it was a real struggle to get our Mark out of the RV to run again! Over and over the video was played. I think Mark found this particularly touching as Mark Beaumont had cycled some of the very same route that we were following.". The effect that Mark's video had on my running during the next 20 miles was remarkable. I set off from Emery at 10 minute mile pace. This felt like I was sprinting considering this was day 27 and 800 miles into the run. I "slowed" down to an 11 minute mile pace and the miles seemed to absolutely fly by. 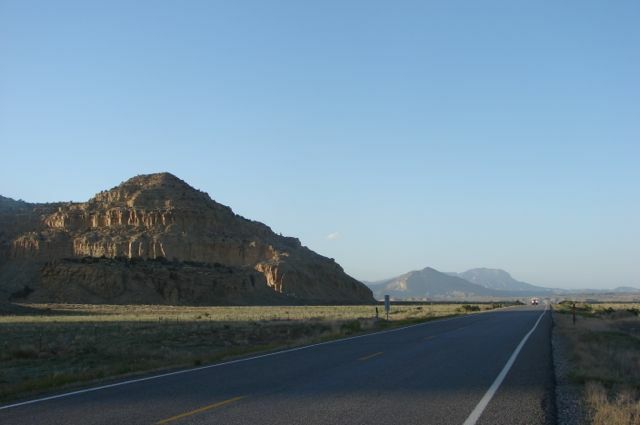 As with some of the previous days, the scenery in this particular part of Utah was quite amazing. The sun was beating down and it was red hot. These were my kind of conditions to run in. I always felt that I could raise my game whenever needed. 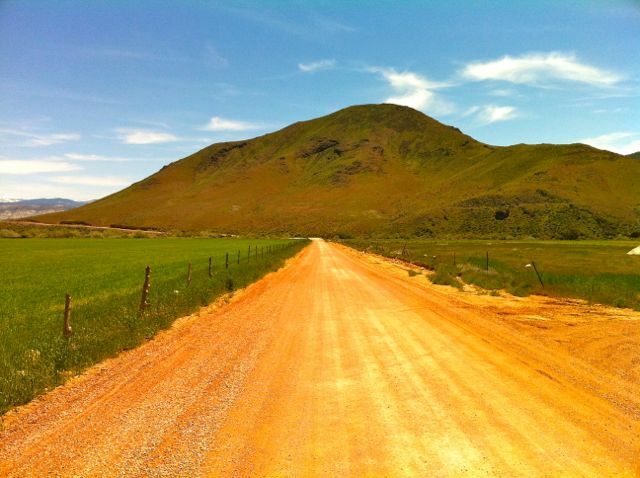 Throw in some hills or a bit of heat and this would usually always give me a raised level of focus and determination. The terrain remained very kind and there were very few climbs to contend with. I used this to my advantage and only stopped very briefly to receive a fresh drink from the support team. I got to the 15 mile point, obviously very euphoric, and tweeted "Just ripped apart the previous 9.5 miles in hot conditions at the start of The Dinasour Trail in Utah. Having a lunch break now.". The quick start to the day meant that I was able to update the blog and answer a load of emails that had been sitting in my inbox. The remaining 17 miles of the day were a lot slower than the first 15. And therein lies the eternal problem with running in a campaign such as this. It often became very tactical. Run too fast (if you had the legs that is) and you have the risk of burning out. Run too slow and you have all of the risks associated with spending a lot of time on your feet. I always felt that by running slower, even if I felt I had the legs to go quicker, meant that I would be able to survive to run another day. And another. And another! Getting the tactics and the balance right across 100 consecutive days of running and adapting to various temperatures, gradients, altitudes, degrees of fatigue and injury and so on was always a difficult task. As I found out though, thanks to the experience that I'd gained over the previous 18 years of running, I would usually get it right. 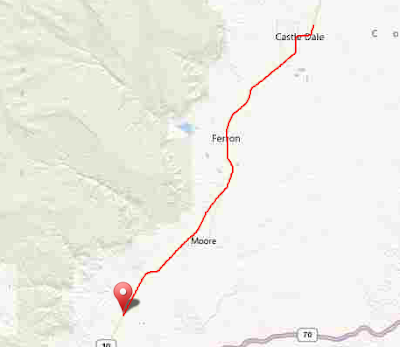 I ran through the towns of Ferron and Castle Dale and reached the 32 mile point with much of the day remaining. Kirsty joined me for the final few miles and she told me that the support team had found a nice lakeside RV park to stay in. This was only the third RV park that we'd used in 27 days. Having been made aware of my usual lack of mobility, the owners gave us a spot near the shower block. I recorded the following interview with Comedy Jon later that evening. Given his obvious talents I'm surprised that he hasn't been snapped up by the BBC! My blog post for the day read: "Nutrition today was spot on and Chef Stephen cooked 3 superb dishes. The final one being a salad which the Support Team and myself thoroughly enjoyed. The meals were carefully prepared following a debate between me and the Support Team. Basically, I have had enough of pasta (for now) and feel very bloated after eating bread. That has now been put right.". 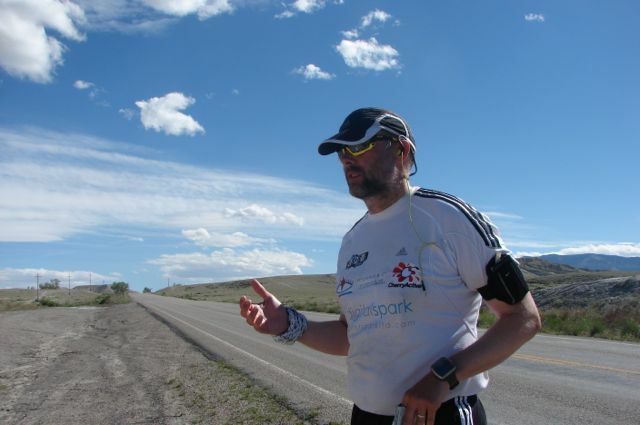 "Today was the quickest 32 miles I've ran so far. It took me 07:26:23. It's a far cry from day 1 when it took me 09:18:10 to run the same distance. That was with fresh legs too. Although I was 2 stone heavier! It was an absolute pleasure to run in yet more amazing scenery today. Utah is definitely my favourite state so far in the USA.". 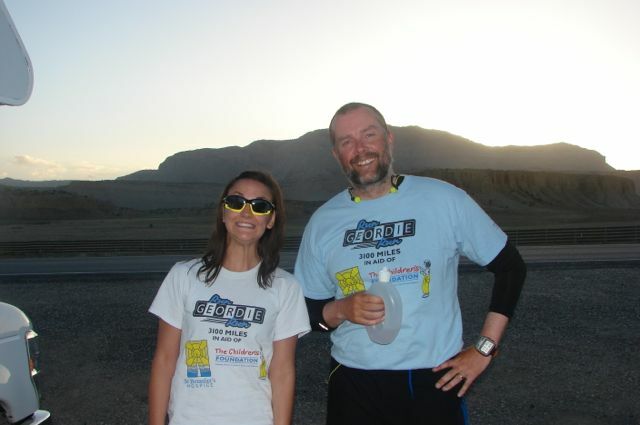 The support for Run Geordie Run and the run across the USA had reached a new level by Day 26. I've got hundreds of emails and Tweets from this time. I often look back through them fondly. Sky's Ben Shephard Tweeted "Mate, hope all's good and the feet are holding up!". It was a shame that the Journal reported your 'bad day' incorrectly. As you rightly put it, you're running 3,100 miles across America in 100 day's...you're entitled to a few off day's (although judging by the reports from Comedy John, you're in an off day mood every morning!). Knowing you, the article in the Journal will only drive you on and encourage you to 'put the record straight' as you always seem to be able to turn a negative into a positive (re Comedy John again...after breakfast!). I can't wait to get out there, to see you and lend any support I can. It's also nice that it will be your birthday...we'll both be in our 40's! Watch how you're going and from over here it looks like you're getting stronger all the time...you are an inspiration to all who follow you. "Hi Mark Having just read your latest update, I want to congratulate on finding the true grit required to get through a couple of pretty tough days. The message in the letter you quoted from was spot on! My American expat friend in Switzerland has been truly moved by your updates about running across his home country and the accompanying photos. And am I ever impressed by the Peter Beardsley photo! Cheers Alan". 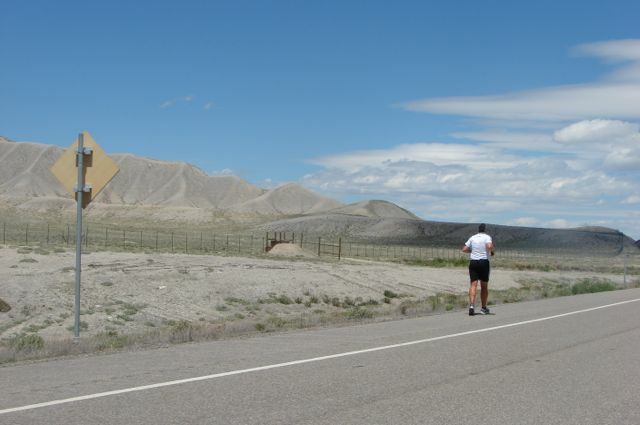 Day 26 of the run across the USA continued on Interstate 70 at 08:25 (Mountain Time) and 6235 ft above sea level. It was another one of those valleys where you think you've reached the exit only to be confronted by yet another section. Such were the surroundings, I found it very difficult to work out whether I was running up or downhill. The only way to tell for sure was to occasionally look behind. It was then immediately obvious that I was running uphill. Comedy Jon had the same experience in the RV. We were both convinced that we were travelling downhill. The adjacent down flowing river suggested otherwise. I later found out that this particular valley in Utah was called Salina Valley. It was yet another fantastic place to run. The surrounding snow capped mountains (part of the Wasatch Range), quick flowing streams and impressive elevation all made for a beautiful backdrop. There were a lot of trucks on the Interstate road. I suspected that there may be some kind of mine nearby. I think that it might have been coal. Thankfully, the hard shoulder was very wide and, while I still maintained maximum concentration, they were always at a safe distance from me. The first break of the day, after just 6 miles, was on the Interstate/Sufco Coal Mine Road slip road. I had a short tactical snooze before setting off again. I was feeling particularly sleepy and I suspected that there would be more sleeps to come. The next few miles had the protected Fishlake National Forest situated either side and I continued to climb and climb! I reached the summit for the day (Emigrant Pass at 7873 ft) after 15 miles. 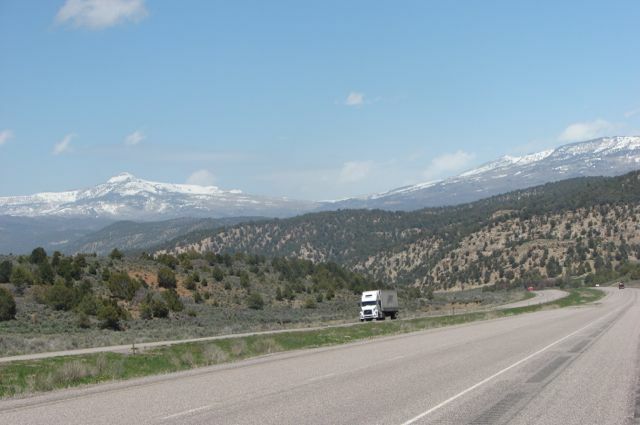 This, apparently, is the highest highest point of any of Utah's Interstate Highways. "As I was snoozing during the second break I heard Shelli, Comedy Jon and Wee Kirsty talking about why they chose to apply to be part of the Support Team. For example, without the help of an organisation in the US similar to The Children's Foundation, Shelli's son Levi would not have survived as a result of being born 12 weeks premature. Comedy Jon's father survived 2 major operations to treat cancer last year and is now in remission. Wee Kirsty's Grandad died from Cancer and her brother was born prematurely. It was obvious that these 3 members of the support of them were here partly because of past family experiences. I lay there half asleep with tears in my eyes having been inspired by the team. Soon after, I resumed running with a nice warm feeling inside. To be fair that may have been something to do with Chef Steve's latest pasta dish!". I finally reached the end of the valley and entered open land after 20 miles. I could see huge mountains to my left in the north (pictured below). 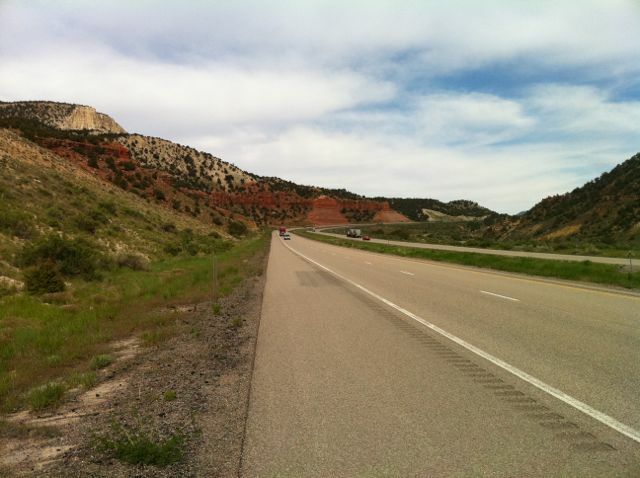 I left the Interstate to join Route 10, heading north, at the 24 mile point. I was fully aware that I'd be on this road for quite a few days to come. I didn't particularly like the mile markers at the side of the road (You may be able to make out mile marker 4 on Route 10 below). I tried not to look at my GPS watch too much during the day. This would sometimes, make the miles go slower as would catching sight of a mile marker! The only advantage of having the mile markers were that they could be used to mark an exact end to a day's running. Kirsty joined me for a few miles and we talked about nutrition. The conversation soon changed to how sick I was of pasta and porridge and Kirsty recommended a couple of tweaks to my diet. The road was very busy with coal trucks and I decided it wasn't safe enough for Kirsty to continue running with me. 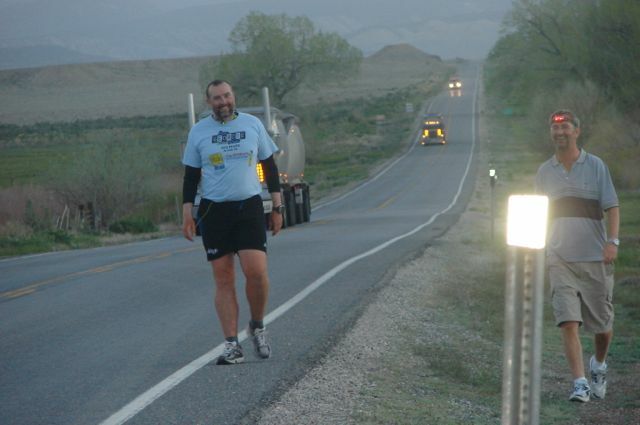 You can see in the image below that I was a couple of stone lighter compared to the start of the run across the USA. I was also growing a beard "like Forest Gump"! Comedy Jon ran the final few miles with me. 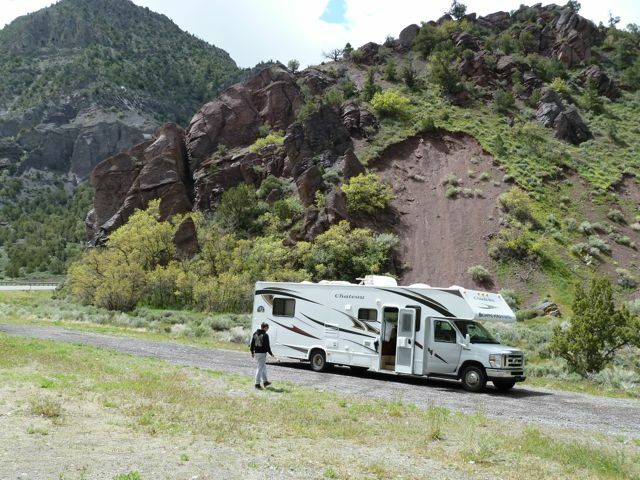 This meant that Stephen had to drive the RV for the first time since he nearly crashed it in Colorado City, Arizona. Thankfully, this particular stint passed without incident. The scenery got better and better. "This was 'wild west' territory" I thought to myself. To my left in the west was a range of high sandy mountains. The land to my right in the east seemed very flat in comparison. 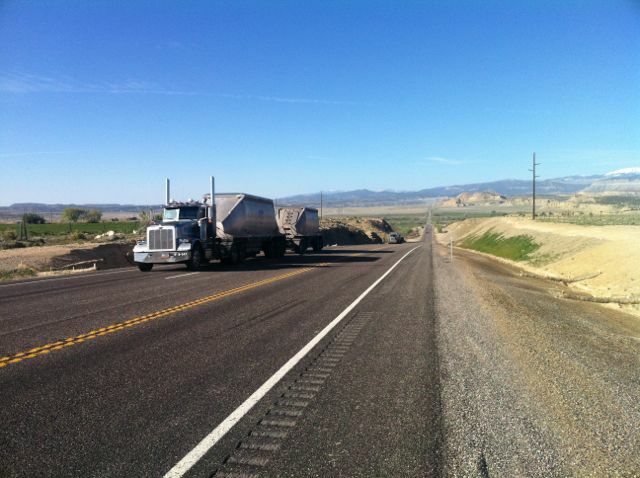 The coal trucks (some pictured below) continued to make their way down the road in vast numbers. After avoiding the many coal trucks, Comedy Jon and I reached the 32 mile point (pictured above) with the final 3 miles seeing the quickest pace of the day. I still, to this day, look at some of the stats in amazement. I can give no reason for some of the quick miles I ran. My final Tweet of the day read "Another 32 miles done today with some serious climbing on a hot(ish) day. Felt great at the end. ". The overnight stop was in a parking lot in Emery under a huge communication tower. It was yet another chance to cut costs! There were some public toilets nearby that the team were able to use. Again, this was another chance to cut down on costs as it cost money to empty the waste in the RV. With 750 miles in the bag, I'd climbed 38,389 ft burning 97,000 calories. No wonder the weight was dropping off me! I've got numerous tough training runs planned during the Summer of 2012 including a non-stop run between, my sponsor, Benfield Motor Group's dealerships in Carlisle and Newcastle. 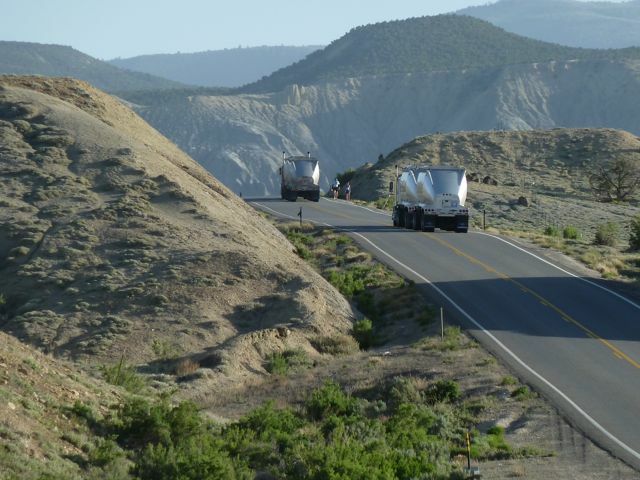 That particular route is 57 miles approximately and will be done during the first week of August. I'll be attempting a non-stop 24 hour run 3 weeks later. This will be done around my old 6 Tyne Bridges route taking in The Millennium, Tyne, Swing, High Level, Redheugh and Scotswood Bridges. It's a 10.5 mile route. I'll hopefully manage to get round 6 or 7 times. 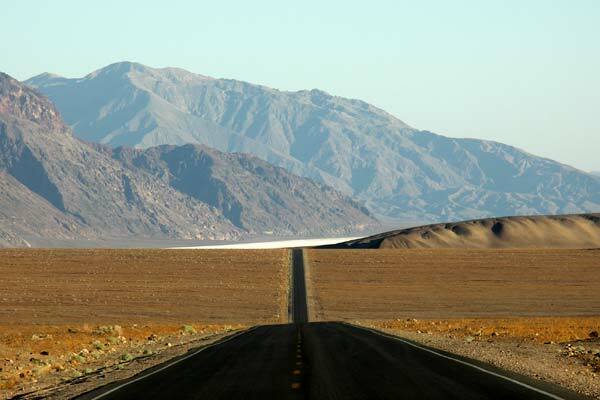 Finally, in September I'll be returning to the USA to do a run through Death Valley. I expect temperatures to be consistently over 40 degrees Celsius. This will be more than ideal preparation for next year's run across Australia. 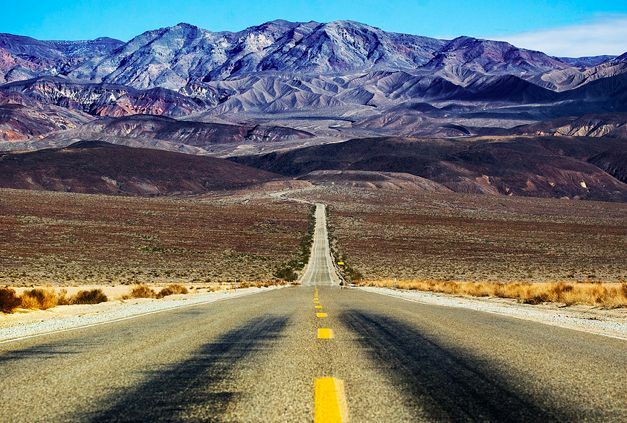 I'm currently looking into several options but the favourite so far is a 135 mile route from Badwater, Death Valley (280 ft below sea level and the lowest elevation in the Western Hemisphere) to Mt. Whitney Portals at nearly 8,300 ft above sea level. If I manage to get through the Summer of 2012 pretty much unscathed I should be in good mental and physical shape and more than ready for the remaining 12 months of training before the 2600 mile run across Australia in 2013. One particular headline in today's Evening Chronicle read "Marathon man helps Robbie Elliott prepare for ride". The article was in relation to my participation in next month's Castle Challenge Triathlon. There is a twist to the tale in that it's in relay form and I'm doing the running leg following former Newcastle United full back, Robbie Elliott's bike ride and triathlete Phil Gray's swim. It's the event's 4th year and I'm very much looking forward to running through a very scenic course around Alnwick Castle (pictured below). Prior to my running leg, Robbie will have cycled from Bamburgh Castle with Phil doing the swim in the North Sea. 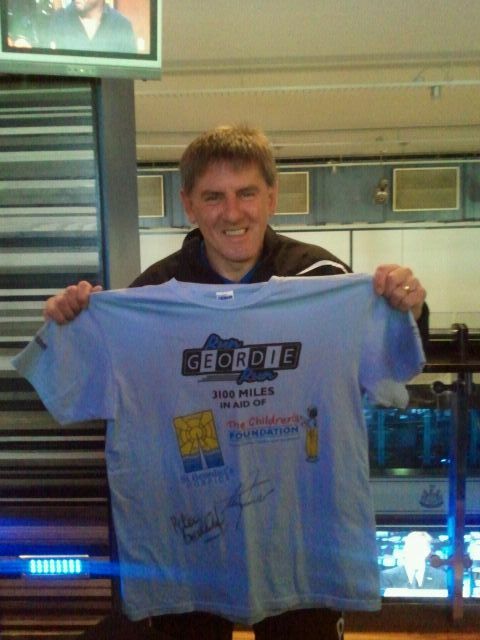 The article in the Chronicle read "HIS epic cross-Atlantic trip inspired the Geordie nation – now marathon man Mark Allison is helping an ex-Toon hero. Former Magpies defender Robbie Elliott is cycling across Europe in a heartfelt tribute to Sir Bobby Robson. 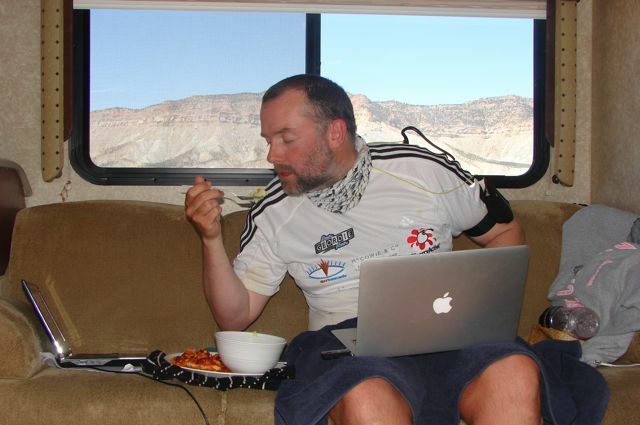 And he’s teamed up with charity champion Mark to prepare for an epic journey this autumn. Robbie’s trip, called Bike for Bobby, will see him and his pal Phil Gray cycle 3,500 miles non-stop visiting all of the clubs Sir Bobby managed during a celebrated coaching career. 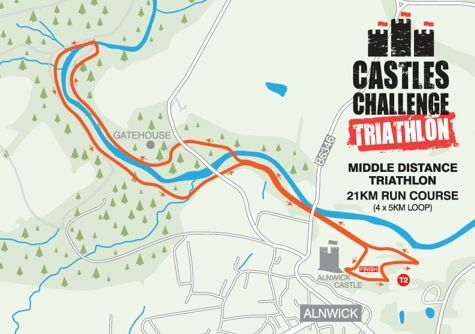 And next month the duo will join Mark – better known as Run Geordie Run – as they compete in the 2012 Castles Challenge Triathlon on July 28 and 29 with Allison running, Robbie cycling and Phil swimming. “I follow Robbie on Twitter and as someone who’s undertaken a big challenge in the past it’s great to see his journey taking place,” said Mark, who will embark on his own marathon trek across Australia next year. It was only after a meeting with Mark, 40, of Shotley Bridge, Robbie decided to set up The Robbie Elliott Foundation (TREF) and raise money for the Sir Bobby Robson Foundation and Breakthough Breast Cancer through Bike For Bobby. Gosforth-born Robbie, 38, said: “When I saw what Mark had done and how much money he had raised I felt genuinely moved. I’d always wanted to do something similar and he gave me the inspiration to launch my foundation and embark upon Bike For Bobby.”. The challenge associated with my usual type of running events are to get from A to B one day and then be able to get from B to C the next day and so on. This particular event is all about getting to the finish line as quick as I possibly can. With less than 6 weeks to go until the Castle Challenge Triathlon it's so important that I make best use of the time that I have left to train. I don't want to let Robbie or Phil down. Let's hope that is reflected in my training. "Coverage of the build up and the actual run across the USA from the Journal newspaper has been absolutely first class over the last few years. And boy how I have appreciated their support and publicity. The Journal is a voice of the North East in print and is read by many of my friends, colleagues and supporters. 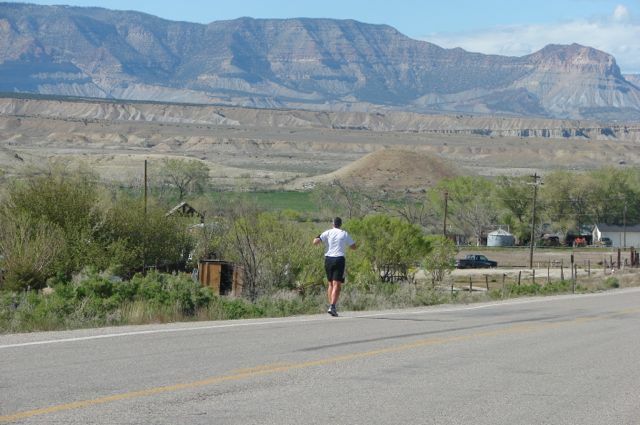 While it was great to receive further publicity in an article yesterday, it's unfortunate that the lack of clarity led many people to worry that I was on the verge of giving up my run across the USA. As regular readers will have seen on this blog, I had a bad afternoon sheltering from lightning showers and fighting an overwhelming sleepiness (probably due to running at a consistent high altitude). I needed inspiration to get me through the day and remembered that I had motivational letters from my mentors; Dave Fairlamb and Mark Fleming. The letter I chose to read, together with the encouragement and support of my Team here in the USA transformed the day into a good one. But, let me make one thing absolutely clear. 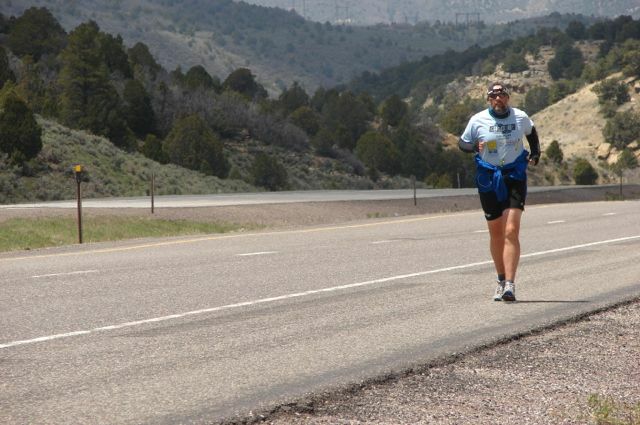 There was never the slightest possibility of me giving up my incredibly tough 3100 mile run across the USA. We all have bad days. I will have further bad days during this tour. But I am here to finish this run and raise desperately needed funds for 2 charities that are very close to my heart. I regret the concern that was caused to many followers in the North East by the article. I am very grateful for the many messages of support. The show must and will go on.". 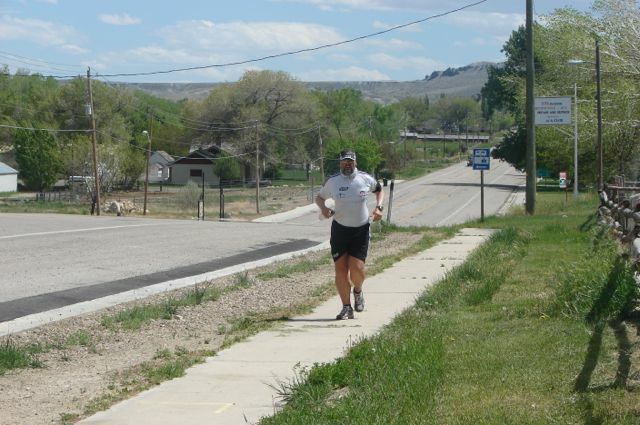 "Angry about piece in Journal newspaper suggesting I nearly gave up running across USA. Reality is nearly gave up FOR THE DAY after 18 miles.". 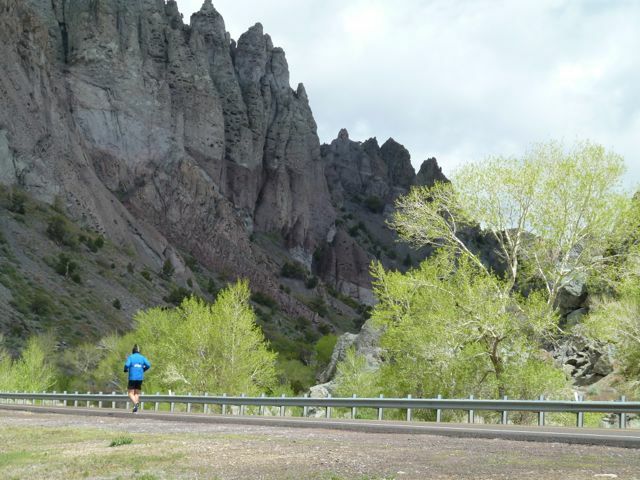 "Reality is not even close to giving up running across the USA while I have a breath in my body. I will have many more bad days but not quit.". Thinking back, it could all seem like a bit of an overreaction on my part. The fact is that, any tiny crumb that I could use to stir up anger could always be used to help put one foot in front of the other. The times when the chips were down, when there was doubt amongst the people following the journey or when the odds heavily stacked against me were the times that I would, more often than not, start running better. There will be plenty of evidence to back this up during the remaining 75 blog posts to come. "5.5 miles done before breakfast. In the RV crying with laughter. Support Team on very good comedy form.". The next 4 miles were pretty quick and I reached Lost Creek Road in good time. The next part of the route was off road and very tricky. I arranged to see the support team at the 21 mile point. What lay between 10.5 miles and 21 were a lot of winding dusty farm roads where a good sense of direction was needed at all times. 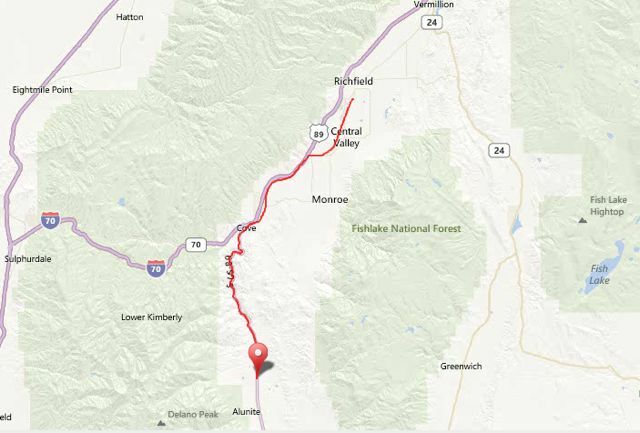 The plan was for the Support Team to take the RV on the Interstate road and I would run along the mostly off road route. The sun was beating down and I knew I'd have to use my water sparingly. 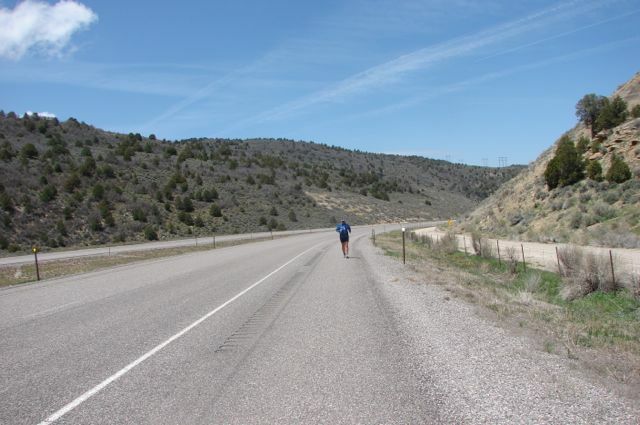 As I ran underneath Interstate 70, I remember seeing a huge colony of tiny birds with nests attached to the undercarriage of the road. That was the first of many such sightings on bridges all over the run across the USA. The residents round these parts were very friendly with the majority of passing folk waiving as I ran past. 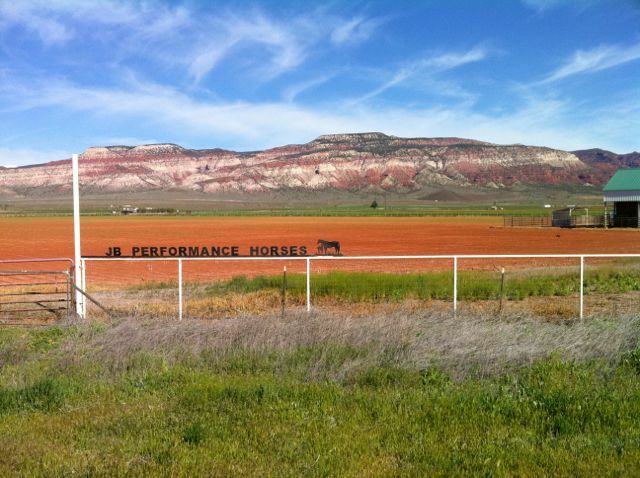 There were some beautiful looking ranches. It looked like a really nice place to live. It took several phone calls and text messages to find the RV. Fortunately, things went almost exactly to plan. I had managed to head in the right direction and the RV parked exactly where was needed. When I actually made it to the 21 mile point I had completely ran out of water and was really thirsty! This wasn't an occurrence that happened too often during the 100 day tour. 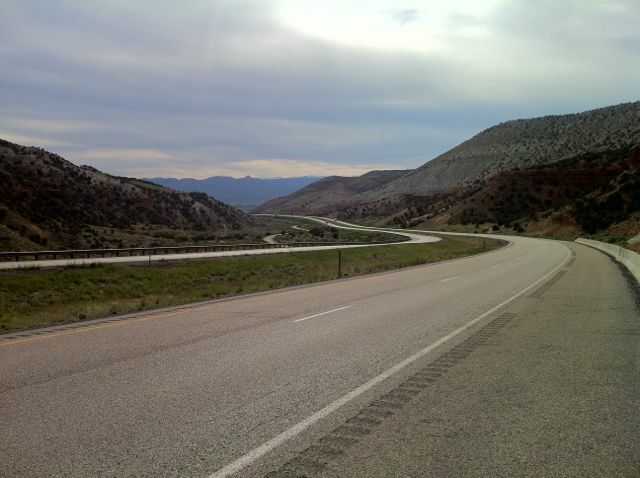 The remaining miles should have been on a path running through the valley adjacent to Interstate 70 (pictured below). Due to some flooding on the path, I had to climb through a barbed wire fence and back onto the main road. I didn't have any complaints as I made some quick progress on the very quiet Interstate road. Despite a climb of 1000 feet, there was a quicker than usual pace during that last 5 miles for some reason. I also remember that the headwind over that last stretch was particularly strong. "So that's 716 miles ran so far on this tour. It was at this stage of my run from John O'Groats to Lands End in 2007 that I started to become noticeably stronger. With sports therapist Wee Kirsty still performing miracles and keeping me injury free I hope to see a similar improvement. I've got just over a week left in Utah then it's into Colorado and some serious altitude. It's all coming together nicely in the first third of the run across the USA.". Shelli Mayfield joined the support team later in the day. I had been really enjoying the banter within the current support team setup. Inevitably, the team dynamic would change with this latest configuration. I just hoped that the standards set by Jon and Kirsty would remain intact. There have been 1000s of very kind and generous folk supporting me over the years. To date, almost £160,000 has been raised for St Benedict's Hospice and The Children's Foundation. Up until very recently, I've simply raised the funds and handed them over to the charities. I've always been at arms length from the charities as a fundraiser. That is, until I was made an ambassador for The Children's Foundation and asked to sit on their Regional Small Grants Panel. The Children’s Foundation Regional Small Grants programme supports community projects that benefit children and young people in the North East in line with their "Happy, Healthy and Safe" aims and objectives. Grants awarded are up to a maximum of £1,000. The panel meets 3 times per year and I've sat on the previous 2 meetings. Recent beneficiaries have included Sunderland Gateway who were awarded £1,000 allowing them to purchase new equipment for their disability sports programme. Monkchester Family Centre based in Walker were awarded £1,000 allowing them to provide dance and exercise classes for children and parents to attend together. Hendon Young Peoples Project were awarded £750 allowing them to purchase equipment and materials to enhance the activities they offer to disabled and special needs children. Since the Regional Grants panel was established, over £200,000 has been awarded to voluntary sector projects that support children with disabilities and their families in line with the aims of the organisation. To play a part in deciding where the money is spent is a responsibility that I take very seriously indeed. Deciding which applicants are successful and those not so has been quite a challenge. On the face of it, most applications seem very worthy. Not all applications, however, fit the criteria laid down by The Children's Foundation. I feel that, having ran 1000s of miles to raise funds for the charity, I'm ideally positioned to sit on the panel. I worked really hard to raise some of the funds that go to make up the Regional Small Grants fund. As a result, I have gained the required level of prudence that you need for this kind of role. One award that I'd like to highlight was made to North Fawdon Primary School (pupils pictured above with Nicola and Libby from The Children's Foundation). "A Newcastle school has benefitted from a new chill-out area thanks to a £1,000 donation from The Childrens Foundation. More than 130 youngsters at North Fawdon Primary School can relax with soft play, bubble machines and interactive games after the school secured the funding from the charitys latest Regional Small Grant round. The Childrens Foundations three main aims are to support medical research into childhood illnesses and conditions; support NHS services for children and young people and create partnership programmes that will address key health and lifestyle issues affecting young people including mental health, disability and safety. In the past year, the charity has directly improved the lives of more than 37,000 children across the North East. Each year its projects are having a wider reach and impact on services and treatment for children across the whole of the UK. Three times a year its Regional Small Grants programme offers grants of up to £1,000 to charities and good causes across the North East. Fundraising manager, Libby Nolan, said: The Childrens Foundation is committed to keeping children in the North East healthy, happy and safe. We are thrilled that North Fawdon Primary School have used our donation to create this chill-out area which will benefit all of the children at the school, as well as future generations.". Details of how to apply for an award can be found here. In the meantime, watch this space as I'll be bringing you news about some equipment, funded by The Children's Foundation, that is used in the Great North Children's Hospital. 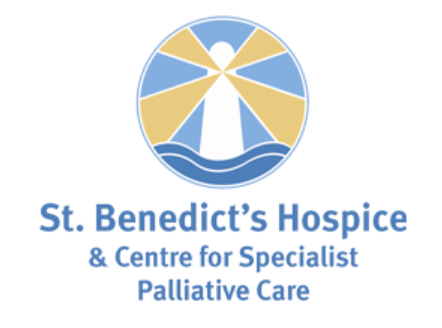 I'll also be writing more about my family's experience of using the services of St Benedict's Hospice. Finally, thank you to everyone who has sponsored me over the years. Together, we have made a huge difference to 2 very worthy local charities. Having been overlooked to carry the Olympic Torch, I was able to put that right today. Down at the People's Theatre in Newcastle I opened the 2nd act of the spectacular Sage Academy Summer Show. My role as "Run Geordie Run" was to carry the "flame" during the "Torch Relay" scene! I followed several flag bearers through the theatre's aisles before taking my place on stage on top of the specially constructed podium. As I held the flame aloft, ITV's Ian Payne's voiceover (click below) explained about last year's run across the USA and the up and coming trek across Australia. With a generous round of applause from the audience, I've got to admit, that it was a very proud moment for me personally. The real stars of the show were the 100 young people who went to make up the cast. I was lucky enough to watch the entire 1st act and almost all of the 2nd act. It was obvious from the very first scene that there was a lot of young local talent involved in the show. From the older more accomplished singers and dancers to the very young performers, there was talent in abundance on show. The first act's theme was Roald Dahl with performances covering Charlie and The Chocolate Factory, Matilda and The Witches. With so many children on stage, in some very well thought out costumes and props, it was a truly spectacular show. The 2nd act, entitled "The Spirit of the games", started off with a solo violin performance by 5 year old Leia Zhu followed by the aforementioned "Torch Relay". Subsequent dance performances backed by rousing pieces such as "Fan Fare for the Common Man", "The Great Escape" and "The Eye of the Tiger" gave the show a level of energy that was matched with great gusto, humour and enthusiasm by all of the cast. There were some very impressive vocal performances too. I don't mind admitting that some of the harmonies emanating from the stage gave me goosebumps! Throughout Act 2, Ian Payne appeared on screen from a mock studio and introduced each sporting discipline. There was boxing, synchronised swimming, dressage and athletics. The highlight of the entire show, for me, was the cast running in hilariously funny slow motion to the theme from "Chariot's of Fire". Eventually, 2 small children (Millie and Abby both aged 7 and pictured above) burst through the busy throng of "runners" to claim victory. The audience responded with great excitement and the show ended with the "Medal closing ceremony" with all cast members present on stage. Thankfully, the People's Theatre is has one of the largest stages in the region. I took a bow with the rest of the cast feeling extremely privileged to have played a small part in such a brilliant show. Thank you to Lucy Sage, Principal of the Sage Academy of Performing Arts, for not only asking me to take part but also allowing a collection for The Children's Foundation to be made after the show. Thanks also to all of the cast and crew for making me feel very welcome. Today's events mean that, one day, I'll be able to tell my Grandchildren that I ran across the UK, USA (hopefully Australia) and also carried the "Flame" in an opening ceremony in 2012. Is it a bird? Is it a plane? Is it Ming the Merciless? No! 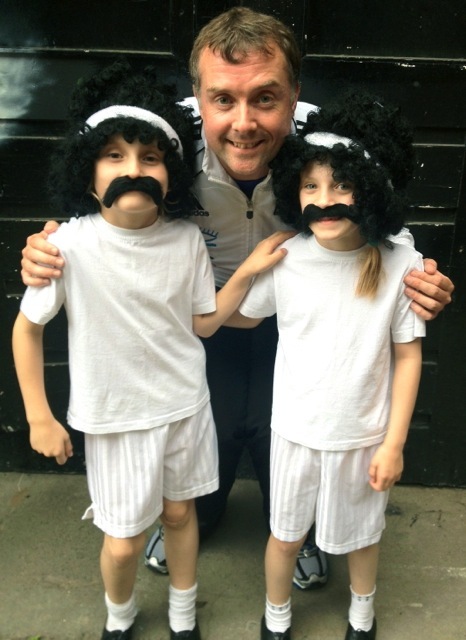 It's Team Run Geordie Run's Mick Butler running the recent Edinburgh Half Marathon raising funds for The Children's Foundation. It's his 3rd event for Team Run Geordie Run over the last few years. Mick was sponsored, very generously, to the tune of £999.99, by Edinburgh Audio Light Systems. They must have thought their money was safe as Mick's participation in the event was in doubt just weeks before he was due to take part. Not only that, but he had a few "comfort issues" during the run. As Mick explains "I picked up a training injury on my ankle a week before the race. I rested and treated it with ice and, with trepidation, set off for Edinburgh with a great bunch of running pals. The first eight miles were fine, the remainder challenging. In an effort to reduce discomfort I altered my stride enough to make a hole in the side of my trainer, so the last 5.1 were completed with my toe sticking out the side of my shoe. Should have been wearing Brooks! Finished in 01.56:00". Watch this space for news of other kind folk raising funds for The Children's Foundation as part of Team Run Geordie Run. For example, there are 20 runners in this year's junior, mini and main Great North Run. My sponsor, Benfield Motor Group, are providing each member with a running vest especially designed by Dave at Shenton Creative. As soon as the final design is agreed, I'll post an image on the blog. If you have a place in this year's Great North Run and would like to join Team Run Geordie Run and raise funds for The Children's Foundation then please get in touch for further information at sponsorship@rungeordierun.com. 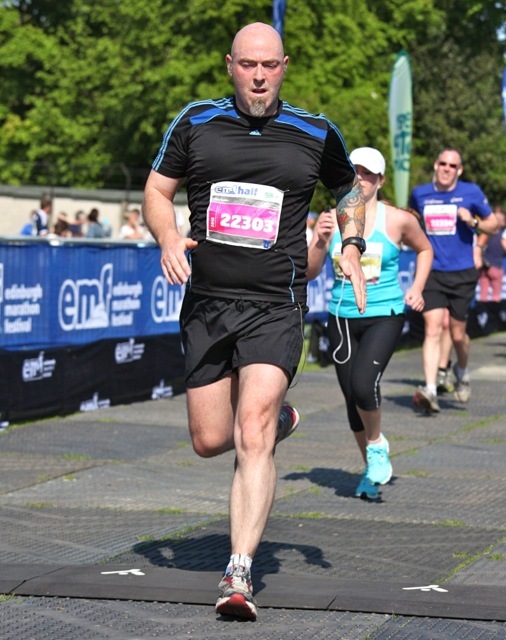 Finally, well done to Mick for completing the Edinburgh Half Marathon in difficult circumstances. Thank you also to Edinburgh Audio Light Systems for their generous sponsorship in aid of The Children's Foundation. Day 24 saw another anniversary of sorts. It was exactly 12 months to the day that Mr Fearon, the surgeon at Newcastle General Hospital, fixed my broken ankle by inserting 2 pins to help the fracture heal properly. In July 2010, Paddy Power made a donation to the 2 charities for the naming rights of my ankle. 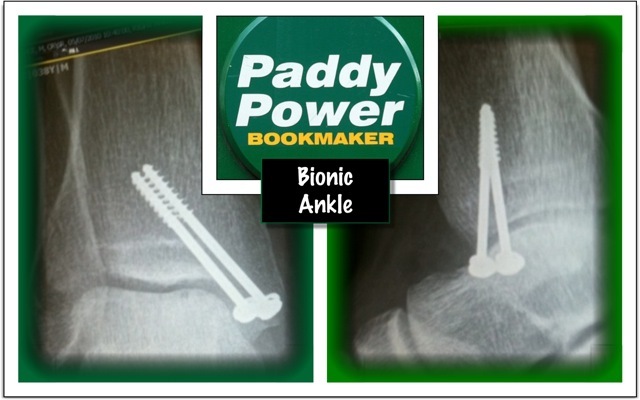 From that moment it has always been referred to as "The Paddy Power Bionic Ankle". "The Journal's headline on page 9 was 'Unlucky break is a setback for epic run'. The sub headline read 'But dream of charity trek is not scuppered'. I must admit, that's exactly how I felt when I lay on the floor just after I fell off my bike a week ago. It's also exactly how I feel writing this blog post right now. I'm still coming to terms with the fact that I've undergone an operation to have two pins inserted into my ankle. Without so much money for the 2 charities riding on a successful 3100 mile run next year, there's no way on earth I would have entertained having an operation. I would have let nature take it's course with the risk of the ankle not healing properly. Having that operation was a massive, massive decision for a big wimp such as me. If anyone ever doubted my commitment to raising funds for St Benedict's Hospice and The Children's Foundation then surely they must doubt no more.". It was a very cold start to day 24, at 07:10 Mountain Time, with icy rain pouring into the valley around Marysvale. Thankfully, there was no thunder and lightening forecast! Apart from Marysvale being the most hospitable place that I'd encountered in the USA (See previous day's blog post), it seemed to be a place with lots of things to do. 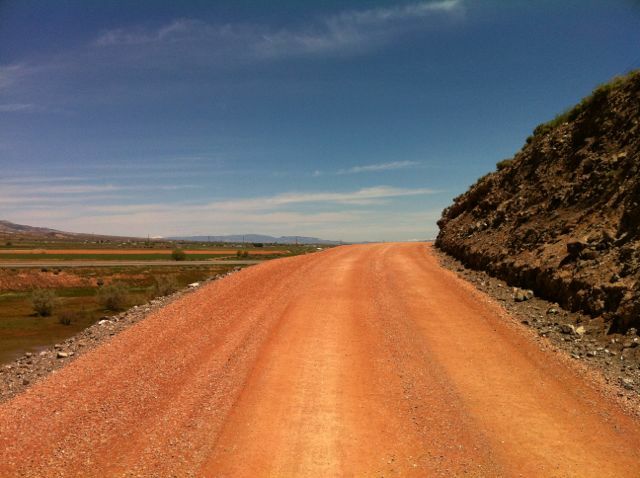 It was situated at the heart of the Paiute ATV trail for one. Aside from horse riding, fishing, cycling and hunting, I think that it was a destination for snowboarding in the Winter. Perhaps I'll stay longer next time! "Comedy Jon reckons I spend the first hour of each day moaning, groaning, scratching and complaining. So with that in mind I did all of the above during the first 2 cold, wet, miserable and dark miles. At the 2 mile point normal morning service was resumed as I had my porridge and Wee Kirsty warmed my legs up with a vigerous massage. I was soon on my way into the pouring icy cold rain. I was just glad that there was no evidence of yesterday’s quick finish in my legs.". Given the damp conditions I didn't really lift my head up to enjoy the scenery. 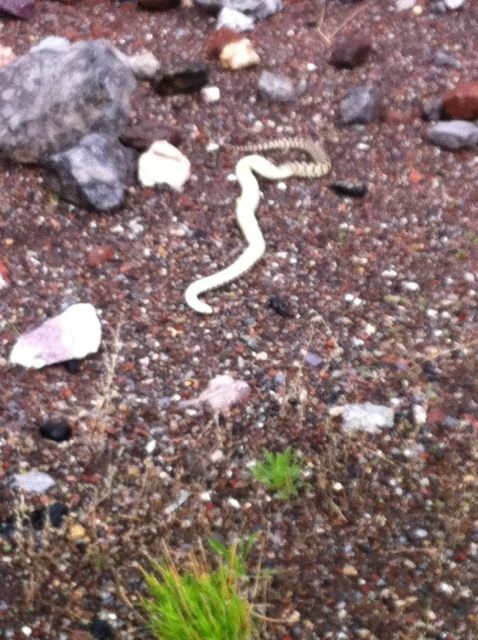 I did manage to spot a dead snake at the side of the road though (pictured below). 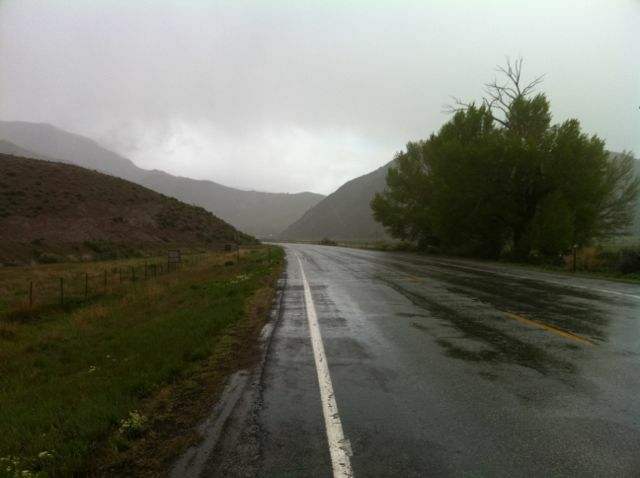 It took 5 miles of running in the pouring rain to reach the start of the long winding valley known as Marysvale Canyon. This part of the route was very similar to the previous day. Just as I thought the end of the valley was just around the corner, there was another section to run along. I stopped to take the photo below. 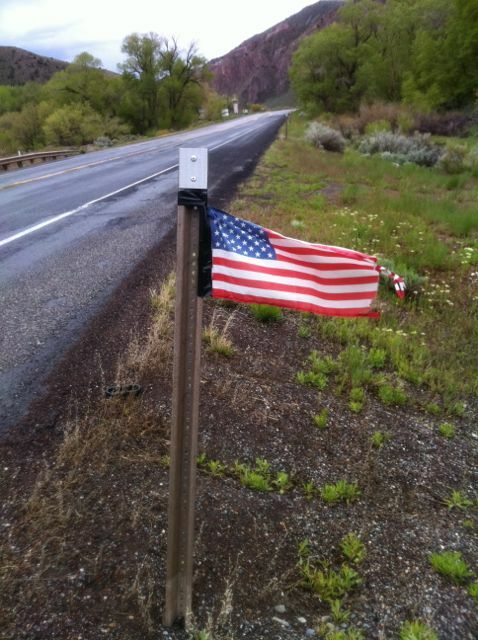 It was the American flag tied to a short pole at the side of the road in the middle of nowhere. Any small incident like that was enough to give the day a bit of a boost. Running at the side of the road day in and day out would prove quite monotonous at times. Without being able to listen to music on my iPod while running I think I would have been driven mad. So please forgive me if I appear a little too excited at the the sight of a dead snake and a small American flag at the side of the road. 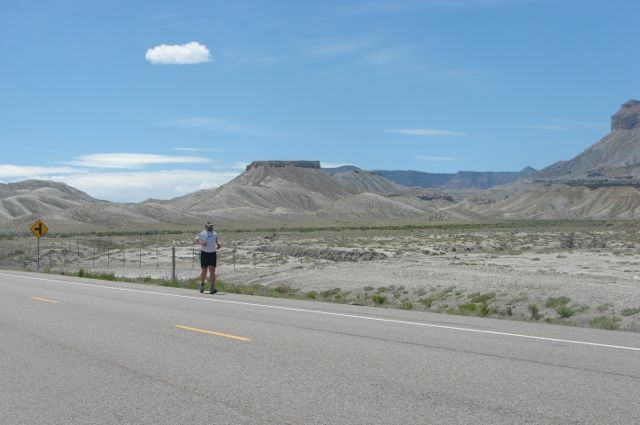 Those kinds of were memorable events during the long days of running across the USA! I met the support team for a bacon and egg sandwich at the 9 mile point and still in the valley. I also took the opportunity to change my soaking wet running clothes. The sun appeared briefly before I got one final soaking for the day. I hadn't seen too much rain up to that point during the run across the USA. I didn't complain too much. 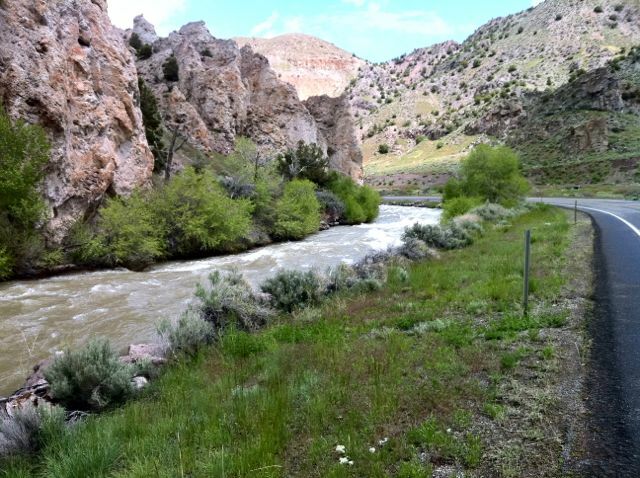 Marysvale Canyon was very scenic indeed with the Sevier River flowing quickly alongside. The sun made another appearance and was to stay with me for the rest of the day. I left Marysvale Canyon at the 14 mile point where I stopped again, this time for a tactical snooze. 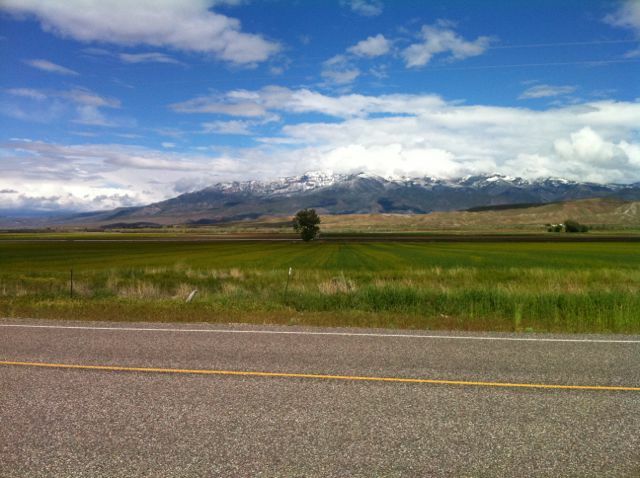 The next section was into a huge expanse of open land with snow capped mountains all around. This section saw some quicker than average miles being ran. It must have been due to a combination of the tactical snooze, the sunshine and the lovely Utah scenery. Later that afternoon, the support team found some unprotected wi-fi belonging to a church in Elisnore at the 24 mile point. I managed a quick update of my blog and we made time for a quick photo. That's Stephen, Kirsty, me and Comedy Jon pictured below. Kirsty accompanied me during the final session of the day to Richfield. We stopped running after 30.5 miles. The "campsite" for the night was another Wal Mart car park. I ended my running with the following Tweets. 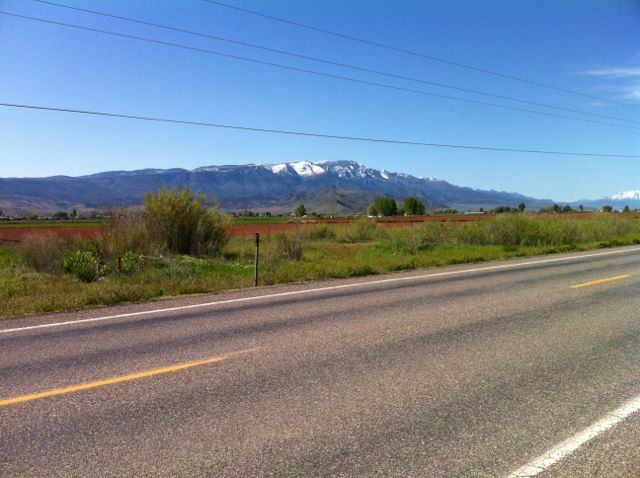 "Down to 5400 ft. Lovely warm, sunny end to the day here in Richfield, Utah." "30.5 miles done. The Support Team are off shopping for supplies. Not a bad day." "Today in the Run Geordie Run RV the team have mainly been speaking in the style of......Alan Wicker." You had to be there I suppose! The support team took the opportunity to get some much needed supplies. This was the first time in a week that we'd seen proper commercialised civilisation. The much needed shower that I had in the RV was interrupted by Stephen knocking on the locked RV door. I didn't know that it was him at the time. There was no way that I was prepared to finish my shower early. This didn't stop him continuing to knock on every wall on the RV to get my attention. I did finish the shower early thinking that something must have happened to the support team. I got dried and changed as best as I could despite my lack of mobility. I eventually opened the door to Stephen who gave no particular justification for his constant knocking on the many parts of the RV. "You ******* idiot!" I thought. I struck a deal with the rest of the team that I would build on today's early start before breakfast with another one tomorrow. The deal was to run 5 miles before breakfast. If I was successful, they would buy me a McGriddle from McDonalds as a reward. I went to bed a happy man that night!